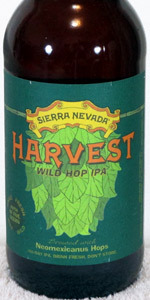 Harvest Wild Hop IPA - Neomexicanus Varietal | Sierra Nevada Brewing Co. Delicious, tropical hop flavor. Perfectly balanced. Nose is melon rind, cactus rind sweet earthy crisp gritty.Not broad or leafy.A flower petal and perfume. Light sweet citrus peel. Melon, tropical sweet grass and damp sweet earth. Appearance is hazy golden yellow with a shy orange blush on it. A stream of bubbles makes it's way straight up from the bottom to meet the creamy rocky moussy head of off white foam that is clinging and falling slowly. Hops have a catty potential you can smell it in the background. First impression is nectar. There's no real juiciness of that fruit just it's sweetness. It's unfathomably light as though the fruits evaporate on the palate quickly and leave behind sweet earth, and a sweet herbal. There's a hint of dank or catty flavor and I like it but then just a dry fruity sweetness with pith and lots of it from grapefruit. A bit of pepper at the very last. The bitter is moderate and this drinks so well. Finishes dry and with a touch of carbonation. I like it. It is a unique IPA. Poured into a Seattle Beer Week pint glass. Pours a medium golden amber with a one finger white head with great retention and lots of lacing. Complex aroma of bready and citrus hops with lots of fruit influence; orange, tangerine, apricot, lemon and light tropical fruit, hay, light dankness. Flavor of dry grassy, citrus hops, with the same variety of fruit flavors: lots of citrus variety, melon, light stone fruit, light dankness all supported in a mild caramel malt body. There's a mild toasted grain flavor hovering the background that fits in really well. Medium bodied with light creaminess. I really like this hop profile, more than I expected to (it sounded like a more morphologically odd than uniquely flavored hop from the description). Possibly one of my favorite new varieties in the last few years. An interesting and flavorful hop variety supported by Sierra Nevada's expected great malt backbone, what's not to love? A beer that makes me wish I didn't have a week's worth of beer backed up to drink in the fridge. I could happily drink this constantly for a while. Hope to see it again. Not a bad beer by any means. Nice crisp and light fluffy mouthfeel, very refreshing and sessionable for the 6.5%ABV. This Harvest series beer would be the easiest of the bunch to throw back. The citrus is a mellow Melon flavor alongside earthiness similar to, but not quite the same as that Classic SN house profile. (If that makes sense?) Very unique hop profile here and a somewhat Lager flavor playing off the hops. Again, this is a very unique beer. Solid offering. Nothing that's going to knock your socks off, but one I'd never turn down. My 1500th rating. Solid wet hop IPA, wish we got it fresher in VA. Bottled on 11/10, made the local stores on 12/19. Found this to be very tasty, wasn't blown away. I really enjoy this IPA; it could easily become a staple if it were available regularly. That said, the hop has to fight to exert influence in the face of the standard Sierra Nevada flavor. I'd like to see this hop show up elsewhere (I like the ring of Medusa Showers). Clean and well made. I would trust SN to make something with wild hops over a lot of breweries. But where did they harvest enough of the stuff to make a commercial batch-- full page ad, inside front cover of WestCoaster. Fragrant but flinty. Crisp. Tasting this after Noble Brewing's Mosaic Showers, a sweet depth charge of malty fruity aromatics, this is almost austere. But it's just what I wanted after the fatboy DIPA. Herbal, inviting aroma. Flavors have some fruity notes, like dried pineapple, pear, and citron, but also some sage and pepper. Toasty malt. I think it's tremendous, as well as being understated and just modestly bitter. It's the thinking man's IPA. From the chubby not-quite-a-quart bottle purchased at Bine & Vine in San Diego. I want more. probably rate higher if I had it fresher. Picked this up for $5.50 knowing it's about 3 months old. A - Expected mild floaties in the glass it's a rather clear amber brown color with a solid inch that takes forever to fall and excellent lacing. S - Not super vibrant hops but they do smell rather clean with a good malty body. T - Pretty good actually a mix of spicy and tropical notes of hops and a semi sweet biscuit like body. Sipping it for a while it does get rather weird. M - Smooth bodied light to medium it's easy to drink. Overall it's a pretty good IPA with a different wild kind of hop. Not sure I would get it again though. Harvest Wild Hop IPA - Neomexicanus Varietal from Sierra Nevada Brewing Co.